Two guys won the Nobel Prize for economics for proving that humans are congenitally bad investors. And some others won the Nobel Prize for proving that the markets are unbeatably efficient at acquiring and responding to information. So, individual investors will never (legally) have better and more timely information than the markets. And, they will never be smarter than the combined intelligence of the universe. 1. Establish your Risk Budget. Don’t take more risk than you should, and make sure that you can tolerate the volatility you’ll face. Great investors have lots of different investments, they don’t take big bets. Investments are not your friends, they’re tools. If it’s logical to do so, they should be sold. Ignore the daily commentary. Take a five-year view and focus on it. Identify good investments by knowing their history. And know what investors have traditionally paid for the profit or the rent the investments provide. Investment prices are based on what the market thinks profits and rents are going to be. Efficient markets will react to information and then think. Investors take time to think, and then act. Decisions made for logical reasons should never be regretted, regardless of the outcome. Be prepared to use managed funds wherever doing it yourself is too difficult. 10. Hone a Super Power – and use it! You can be something the markets and other investors can’t – you can be PATIENT. 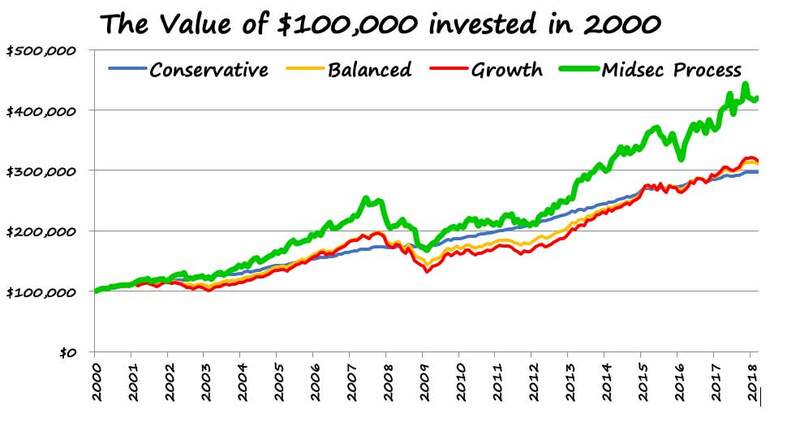 The Midsec Investment Process* has successfully outperformed each of the Conservative Fund Index, the Balanced Fund Index, and the Growth Fund Index, two thirds of the time since January 2000. 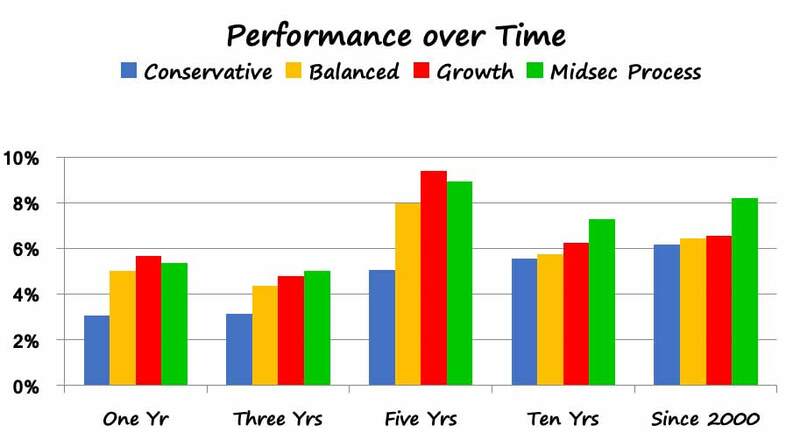 * The Midsec figures are based on the median investment annual performance experienced by clients each month. The charts below are to the end of April 2018.